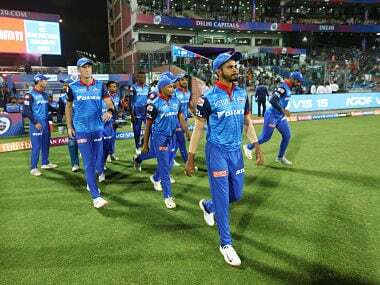 Kanpur: Young Shreyas Iyer missed a magnificent century by four runs but that was enough for Delhi Daredevils to edge past Gujarat Lions by two wickets in an inconsequential Indian Premier League (IPL) clash at the Green Park Stadium in Kanpur on Wednesday. 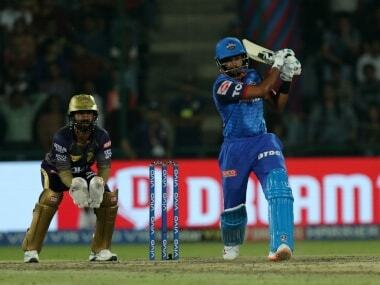 If Rishabh Pant and Sanju Samson demolished the Gujarat Lions in their away encounter at the Ferozeshah Kotla in Delhi last Thursday, it was Iyer, who almost single-handedly tamed the Lions in their own den with a 57-ball 96, his highest IPL score. Languishing at the bottom of the IPL standings and already out of contention for the play-offs, both the sides had nothing to lose in the contest. With the win, Delhi rose to sixth while Gujarat are at the penultimate spot in the eight-team table. Chasing a mammoth 196, Delhi lost half their side for 105 runs before Iyer and Australian Pat Cummins' cameo (24 of 13 balls) guided the visitors to the win. Gujarat on the other hand, were electric on the field with skipper Suresh Raina and all-rounder Ravindra Jadeja, accounting for three brilliant run-outs of the in-form Pant (4), Marlon Samuels (1) and Corey Anderson (6). Delhi failed to get the momentum with the run-outs having lost opener Samson, bowled by left-arm pacer Pradeep Sangwan after scoring a 7-ball 10 before losing Pant immediately off an excellent throw at the stumps from Raina. Karun Nair (30) and Iyer then stabilised the innings with a 57-run third wicket stand before the strategic time-out once again did the trick for the home side, in the form of Nair's dismissal. Nair, after facing 15 balls and helping the ball to the boundary on five occasions and once over it, lofted a slower delivery from Australian James Faulkner only for Dwayne Smith to take a reverse-cupped catch at cover. Jadeja then made his presence felt, effecting two quick run-outs, first of West Indian Samuels and then New Zealander Anderson to make things worse for the visitors. Tottering at 105/5, medium pacer Dhawal Kulkarni added to Delhi's frustration with the wicket of Carlos Bratwaite (11), who got a top edge for the bowler to take a simple catch at cover. It was after Iyer and Cummins came together to milk 29 runs off 10 balls when Delhi could smell the victory. Iyer first dispatched Sangwan for two consecutive boundaries and then meted out the same treatment to Kulkarni. Cummins too joined the party, using the long handle to good effect as the Australian raised a valuable 61-run stand for the seventh wicket with Iyer to take the visitors within sniffing distance of a win. Cummins, in his attempt to get to the target quickly, lofted Faulkner to long-on only for Smith to take a comfortable catch. The Australian's 13-ball knock was laced with two boundaries and a massive six off the same bowler. With 14 needed off seven deliveries, tailender Mohammed Shami (4 not out) managed to push one to the boundary to reduce the margin before Basil Thampi in his second delivery of the final over, got one in the blockhole to blow Iyer's middle stump. Leg-spinner Amit Mishra (8 not out) then whacked two consecutive fours to seal the deal in favour of Delhi. Earlier, Australian Aaron Finch's flashy 39-ball 69, laced with six fours and four sixes helped Gujarat Lions recover from the early jolts and post a mammoth 195/5. Finch's 92-run fourth wicket stand with wicketkeeper-batsman Dinesh Karthik (40) helped the Lions recover after losing the early wickets of opener Smith (8), Raina (6) and Ishan Kishan (34). Put in to bat, Gujarat found themselves reeling at 56/3 before Karthik and Finch began the recovery sensibly, taking the odd singles and helping the bad balls to the boundary as the run rate dropped a bit midway into the innings. Delhi found it tough to break the partnership with both the right-handers stepping up the gas to race to 148/3 by the 16th over, before West Indian Brathwaite managed to pack the Tamil Nadu-born stumper, who had faced 28 balls by then and struck four fours and a six. Thereafter, Finch, who by now had reached his 50 off 32 balls, struck a few blows to add 32 runs for the fifth wicket with Ravindra Jadeja (13 not out) before Shami's full delivery blew the Australian's middle stump. Towards the end, Faulkner (14 not out) and Jadeja added 15 runs as the home side milked 61 runs off the final five overs. 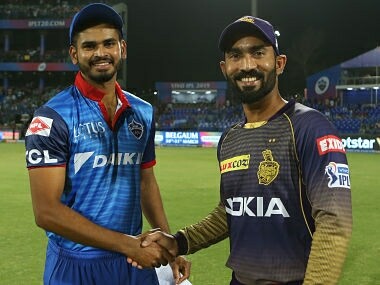 Brief Scores: Gujarat Lions 195/5 (Aaron Finch 69, Dinesh Karthik 40, Ishan Kishan 34, Amit Mishra 1/27) lose to Delhi Daredevils 197/8 (Shreyas Iyer 96, Karun Nair 30, Pat Cummins 24, James Faulkner 2/39) by 2 wickets.